Home > Share Fundamentals > Great long term returns- What Sectors for the Next 5 Years? Great long term returns- What Sectors for the Next 5 Years? If you are a value investor and you are looking to identify sectors for great long term returns, today's chart of the day could perhaps lend you some help. It highlights the sectors that have accounted for nearly 75% of India Inc's profits in the year 2015. As you can see, IT, Auto, Utilities, Healthcare and Auto Components contributed three fourths or close to 1.3 lakh crores to the profits if data by a leading business daily is to be believed. This is in sharp contrast to the year 2010 where sectors such as metal and mining, construction and telecom were some of the biggest contributors. 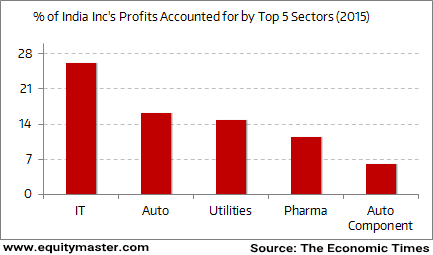 However, with these sectors struggling to make profits on account of one factor or the other, they got pushed out of the top 5 list. Looking ahead, which is the sector you would like to bet your money on from a five-year perspective? Well, everything that goes up has to come down. And therefore, if this rule is to be applied, sectors that have been out of favour could again come in favour. However, one needs to identify definite signs of turnaround and only then invest in these sectors. Also, valuations need to be taken into account. Investing in a fundamentally sound stock with good margin of safety in valuations could turn out to be a good long term move.